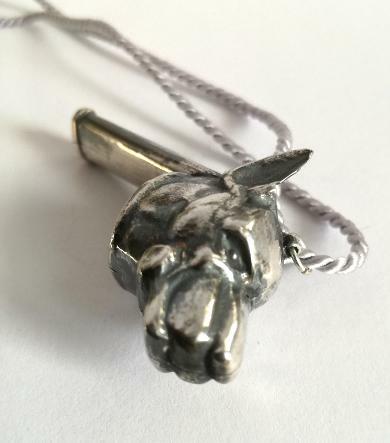 Beautifully handmade, sterling silver dog whistles, inspired by ancient shepherd whistles. The only dog training aid you will want to wear as jewellery! Put some glamour into dog training! I am a London based Silversmith and make dog whistles out of solid Sterling silver. My Wolfwhistles are not only powerful training aids, but also beautifully handcrafted pieces of jewellery. As silver is anti microbial, this also makes whistling much more hygienic than using fingers, tin or plastic. What a way to create a, literally, beautiful bond with your dog! Here is a taste of my new Limited Edition whistles, more under the Styles tab! The Alpha Whistle is made of solid 925 Sterling silver and whistles just by blowing into it. At 5cm long and 2.5cm deep it is a striking piece of jewellery and quite masculine. Inspired by the Akita. Available on twisted silk cord or black leather. 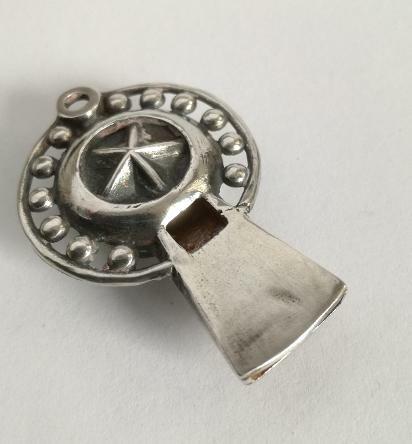 The Star Whistle measures 4cm long/2.5cm wide and is made of solid 925 Sterling silver. It works by simply blowing into it (so no practice required like with the Shepherd Style Wolfwhistles!). Currently I have NO more Shepherd whistle style Wolfwhistles in stock. But have a look below and in the Styles section anyway! The 2018 Wolfwhistles will feature new surface designs and I will update the site once I am happy with them. They were the medals for the the International Sheepdog Society Trials in 2012,2013 and 2014, including the Gold Medal for the WORLD winner in 2014!!! Wir sprechen auch deutsch! Ein wenig mehr ueber die Wolfwhistle auf Deutsch finden Sie unter ' Use and Function' (oben im Menü) und dan auf 'How to wolfwhistle-in German' klicken! Bitte alle Fragen direkt an gunilla_karlson@yahoo.co.uk.Wir freuen uns von Ihnen zu hören!!! !